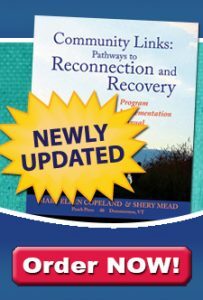 Linda Meyer is a NJ Certified Recovery Support Practitioner (CRSP), NJ Certified Adult/Older Adult Peer Specialist (CPS), and a Certified WRAP Facilitator. Linda is married and a Mom of 7 children and works in an urban hospital in Philadelphia facilitating WRAP workshops and WRAP transformation groups. Linda has also opened her own private motivational wellness center in NJ called “The Support Place; Where Hope Lives” offering individual support sessions and WRAP transformation group sessions. There was a time in my mid 40’s when my depression became so bad that the only way I thought I could feel better was to just die. I suppose it was a way of controlling the uncontrollable when every emotion and every physical pain left me without control and feeling hopeless. This feeling was very hard for someone like myself who had a lot of hope and was very much in control of my life. I was happily married, raising our 7 children, and beginning to work outside of the home. Until I discovered WRAP, I didn’t have the self-awareness to begin to control the many thoughts and feelings I was experiencing, like feeling down and depressed and just wanting to die. But in the mental health world of trying to recover from the severe flat depressions and the suicidal thoughts, my failed suicide attempts left me floundering in a world with no tools and too many people controlling me. This led to 27 hospitalizations and I began to understand that being controlled was exactly what I was trying to avoid. It wasn’t until I was able to explore and learn about myself and discover that what I didn’t understand were triggers at the time. My awareness from WRAP gave me the control I needed to help myself. This new awareness of my triggers allowed me to ‘peel my triggers apart like an onion’ to reveal the many layers that I needed to become aware of to keep from the deep feelings of depression and suicide. The hypersensitivity I experienced from the obvious trigger of being controlled gave me incredible insight that there must be a reason for my hypersensitive reactions to everything else. Once I felt hope I had a fighting chance against the people who I thought were my supporters but who didn’t know how to help me. It turned out that the only real supporter I had at the time was my psychiatrist. Through his help and the creation of my Crisis Plan, I was able to begin to peel the onion layers more and identify a different part of my existence that ordinary life didn’t allow. This transition and the identification of more of my triggers led me back to my childhood where it all started, with traumatic events that I had repressed most of my life, events that I of course had never been able to recognize as trauma at that age. The metaphor that I use in my professional work to help others in this process is a past and present graphic with the past on the left side, the present on the right side, and a bridge in the middle. A big circle of ‘quick sand’ has almost filled the entire left side of my past. It is a reminder that we have to cross over the bridge to our past and bring back the good and bad parts of our past quickly. We cannot stay so long that we get re-triggered, but we must never forget. We bring it to the present and process it on the concrete foundation that will begin to grow from our new awareness and create a sidewalk to the future. Through this process we can begin to learn more about ourselves and why some present events become triggers that cause the feelings of depression and thoughts of suicide. I keep asking myself, what is it that is triggering me? Each time I identify it, like the trigger of being controlled, I peel another layer and begin to reveal more triggers; like certain voices, attitudes, ignorance, someone not following rules, people being taken advantage of, me not being in control, me feeling vulnerable. I realize these constant triggers affect many parts of my life even if the original obvious trigger is not there. I realized that my present triggering event is from witnessing a police brutality incident where a man almost died. Testifying in court brought up memories of my childhood experiences and unrecognized triggers. When I was 9 years old I was in the same courtroom as the present court case testifying against my perpetrator and feeling so vulnerable from being taken advantage of by boys and men. Because of my past/present graphic, I have linked it to the beginning trigger of fear in a little girl who was controlled by boys and men and it answered many questions of myself like why I always beat the boys up, why I became so competitive in sports and enjoyed beating them at something they thought they had power and control over, and why I struggled with male teachers who again were in control of me. Because of this incredible awareness, I was even able to identify why I react very angrily at someone not using a blinker while driving. For me it represents someone causing me to be able to lose of control of my vehicle because they are disobeying the law, just as my perpetrator did from my past and the police did in the present. All of these triggers led to a buildup of hypersensitivity and continually being triggered and not understanding what to do about it. The depression got heavier and deeper to where I constantly lived in a state of suicidal thoughts. Taking my own life was the only way I felt I could regain my control of it. I realized the controlling treatment from people who tried to help me was only making those depressed feelings worse. Since I refused and struggled against taking medication, feeling it was giving more control to those who were treating me, my action plans became very basic and lifesaving. I have immediate action plans and I have continued action plans, which are very different. For instance, an immediate action plan to someone not using their blinker while driving might be for me to yell “BOZO!”, shake my head, and take a deep breath. I feel it, acknowledge it and then I am ok. If this single trigger is compounded by other triggers in one day, and I begin to feel more angry, depressed or suicidal, I reach into my continued action plans; I listen to my music, I continue to drive as driving is a wellness tool; I might go to the movies, go shopping or even go play pinball which is a wellness tool and an action plan that helped me in my childhood years, and as an adult helps to soothe the little girl in me. If these action plans are not effective and medication is not an option, I continue to examine and identify the sensory needs that are a very important part of my wellness tools and action plans. I do things such as eating something new and different, going to the batting cages, going to the beach, and doing anything I want to do to fill those sensory needs until the feeling passes. This helps to soothe me, calm me, and allow me to get back in control, eliminating the primitive trigger. Unfortunately there have been times where some of my wellness tools, like driving, have not worked. I become more stressed and begin to dissociate, sometimes for days. So instead of being lost while dissociating, worrying my family, and being unsafe, my WRAP and my awareness of this allows me to reach into some of my more extensive action plans. For instance, my husband knows to drop everything to drive me around, divert my attention anyway he can, and spend special time with me to fulfill my sensory needs while trying to help me stay safe. During this time, my family is alerted that Mom is not well. The whole family becomes not only my support but each other’s support as well. Everyone does whatever they need to do to allow me to get through this very bad time in my head. Their awareness is as important as mine, and they learn for themselves how my WRAP keeps me safe, and they learn first-hand how important it is to help each other. Sometimes I know I can’t leave my bedroom because I will attempt to ‘run away’ as I did when I was a child. I can’t go near the kitchen or have access to my van keys. This is very different from my years of being unsafe because my home was not my safe place, it was my van that was my safe place. Now, I have learned to use my home as respite. Someone stays home to ‘babysit’ me rather than my going to a hospital only to get more traumatized by doctors who do not know me and to be given medication I don’t want so as to not risk commitment. WRAP helped me recognize this and it is amazing how I have felt comforted by something that was once an intense trigger, my own home. My family is aware of when I am depressed as they know my ‘Early Warning Signs and ‘When Things Are Breaking Down’ parts of my WRAP. My family assists and supports me with my Action Plans even if it is watching me eat my favorite Chinese food for days on end. It is so much better to avoid the traumatic past experiences of getting a call from the police that I am almost dead, or having the police come to my home to take me to the hospital. My WRAP has allowed me to be so in tuned to my thoughts and actions that my family has learned from my new self-awareness. This awareness is also a huge part of why my action plans work because they recognize all my warning signs before they become dangerous. I also became aware that I experienced these feelings as a teenager and that I had managed to balance them until many triggers at once challenged my very existence. I also recognized that the suicidal thoughts were always in my head and that one trigger can strengthen them. Understanding the childhood wellness tools and action plans that helped me through those traumatic years has allowed me to take them from the past and use them again as an adult to give me hope and stay alive. Something else became very apparent through this recognition, and that is my incredible self-awareness of being able to peel apart an obvious trigger in order to allow me to understand logically why it is a trigger and what it truly reveals. The power of this is incredible. Now I challenge all my triggers that were once firecrackers until they are duds. Almost all of my triggers are no longer triggers. No more hospitalizations, no psychiatric medications. My continued transformation from a crisis is evolving each day because of my new action plan of spirituality that has become my everyday wellness to help me understand I am my own best supporter and I am worth living for.